I first heard the tenores from Oniferi on the small Italian Taranta label (see our Ballos Sardos Vol.1 review), and so it's good to find them being given some international exposure by this larger American one. It's also good that the general record buying public now has the chance to hear something other than their opposition from Bitti. Because what you get here is quite different - the Oniferi singers are younger, faster and harder ... both more suited to a 'World Music' audience and closer to (my experience of) the tradition. It's a good trick if you can do it. Oniferi is a town in the central Barbagia region of the Island, and smack bang in the middle of the area where the cantu á tenores is still performed. The boche (lead voice) is Francesco Pirisi, who is 40 and his twin brother Giovanni sings contra. They were born in the neighbouring city of Nuoro but had moved to Oniferi by the time younger brother Carmelo (mesu boche) was born in 1962 - you can't beat a family band! The bassu is Raimondo Pidia, born in 1961 - so this is a very young group ... and they sound like it. Don't think that this means they are a sort of Sardinian Young Tradition, merely that they have none of the pitch inaccuracies or loss of tone we English may have come to associate with traditional singers. Certainly, I find this CD much more enjoyable and exciting than the Tenores di Bitti albums available from the major labels. This is not to denigrate their work in any way - the 'Ammentos' and 'Intonos' CDs on Robi Droli's NewTone label are both excellent and I believe that there are a number of other, earlier releases on several small Sardinian labels which are equally good. But the Bitti singers do tend towards a smooth, rich sound which is less to my taste than the rougher, harder sound of these Oniferi chaps - and a number of other traditional groups I've been lucky enough to hear. The songs are all pretty standard cantu á tenores fare, but sung with great style and that essential ingredient - passion. The harmonies are incredibly tight and the elusive fifth harmonic voice, the 'quintina', is to be heard almost at every turn (I don't know whether you will be able to hear it clearly in the mono sound clip of Sa Supposta Partenzia). I think this is more usually found in the Sardinian 'Coro' tradition, where the songs are much slower and there is more time for the harmonies to gel - producing this ephemeral overtone which actually sounds as if a soprano had momentarily joined in the chorus. 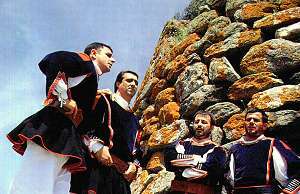 One of the songs is unusual - Gosos di San Gavino is one of the few songs where the chorus sings actual words rather than the rhythmic vocables which characterise the cantu á tenores genre. It is a religious text honouring St Gavino, a third century Sardinian martyr who is also the patron saint of Oniferi. Almost every town where this singing is continued has its own version of this song. Given that this is a full price offering, it's outrageous to find that the booklet contains only three brief paragraphs about the music and nothing about the singers except their names. (The biographical information above comes courtesy of the Taranta booklet!) Even the contemptible Realworld Bitti offering did slightly better than this - even if much of it was invented or downright lies! However, the lyrics of all the songs are here, in Sard and in rather good English translations but, to be honest, most of them are loosely connected lines of love or longing which convey little additional meaning to the experience of hearing the singing - I remember being similarly deeply disappointed when I first saw translations of Amédé Ardion's repetitious, macho lyrics. An exception is Sos Antigos (The Ancestors) - a song of nostalgia for the old rustic life and ways of the former generations. It was written by the local poet Antioco Casula Montanaru (1888-1957), who lived at a time when progress had begun to change the lives of the Sardinian people - even the shepherds. It is sung in a particularly heartfelt manner by Francesco - himself a shepherd. The poetry of the song is quite beautiful, even in translation. I would strongly recommend this record to anyone with an interest in Sardinian music - and to anyone else with a fascination for the wonderful things that four human voices can do together. Music of the World records have a web site at www.MusicOfTheWorld.com and are distributed by Stern's in the UK.